LaQuita Gaskins (center) presents a $1,000 scholarship to Simmons College. The National Notary Foundation has endowed a $1,000 scholarship to Simmons College of Kentucky on behalf of 2015 Notary of the Year LaQuita Gaskins. 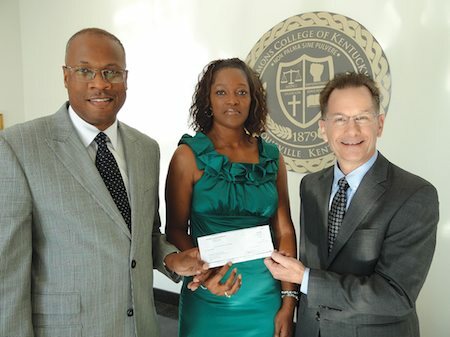 Dr. Frank Smith, Jr. accepted the check on behalf of the college during a brief ceremony on campus. Gaskins and Bill Anderson, NNA Vice President of Government Affairs, also attended. Each year, the Notary of the Year is selected from nominees across the country who best exemplify the ideals of integrity, impartiality, competence, selflessness and public service in the critical role of protecting citizens from ID theft and document fraud. In recognition of these exemplary qualities, the Notary of the Year is awarded a $1,000 scholarship from the National Notary Foundation to benefit the educational institution of their choice. The NNA is currently accepting nominations for the 2016 Notary of the Year, who will be announced at NNA 2016 Conference. We’re looking for nominees who excel in community service, mentorship of other Notaries, working to enact needed legislation, providing notarial services to the less fortunate, trailblazing new technologies, or public speaking to promote the Notary office. To nominate a Notary of the Year candidate, please fill out and submit the Notary of the Year nomination form. The deadline to be considered for 2016 is December 1 and submissions after that date will be considered for 2017.